For the past five months, my Sunday mornings have been littered with adjusting my fantasy lineups, drinking strong coffee, walking around my beach house in a parka, and playing the same piano songs over and over. A little different here. 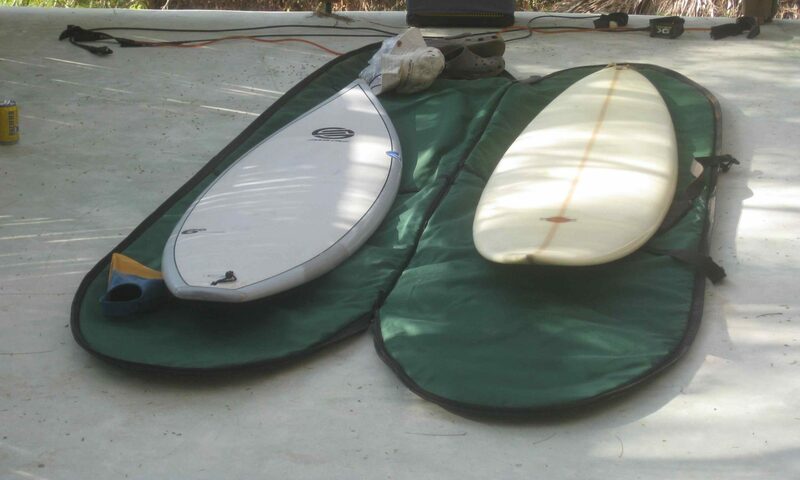 After a Special K/Frosted Flakes mix, I put some more extra hard wax on my composite 6’6, and got a ride with Papa Chango(PC) down to the beach break. Driving very, very slowly, as to not stir up dusty soot on anything, anybody, or any thin canine, I tapped my fingers to Desperado on the top of his Element. It was about the 50th time he’s played that classic since I’ve been here. Still pretty small out there by Puerto’s standards, yet, a friendly invitation to enter the waters that normally have surfers coming up with injury excuses as to why they CAN‘T paddle out. If you’re an expert surfer, you can log as much tube time as the morning is long…even at waist high. If you’re a young, expert surfer, you are considerably more willing to trump the 80% closeout ratio that MexPipe offers up. I am neither. I am always looking for a faint shoulder or a modified peak, yet it’s the walls that appear unmakeable which ultimately become the piping tube rides. It’s a guts and glory sort of proposition. As I approached the water, I witnessed a clean “in & out”, made to look easy by some Mexican with long hair. The wind was blowing hard offshore, and I actually felt chilly. The chill usually goes away pretty quickly. It was 8:30am. One hour surf story, short, I took off on approx. 10 waves, made about five, got pitched 3x, and pulled into a couple of small closeouts. Lost my board to the shore about half those times, yet it’s only a 50yd swim in to get it. I’m trying to get used to riding without a leash and managing my board and my wave because when it gets bigger, and you decide to “pull in“, the last place you want your surfboard,(if you need to bail) is anywhere near the vicinity of your body. It’s poor-mans insurance. By 10am I was back at my tree(more on it later) and feeling exhausted. I took a three hour nap. I had been sleeping well at night, yet last night I had this extra bizarro dream that I was in a bus wreck with Shaquille Oneal and many other NBA superstars. There were some hotties on the bus too if I recall. The bus went off the cliff and everybody died except me and Shaq. When life vs. death came to a head between the Diesel and I, let’s just say the Big Aristotle had his way with me. I digress. Oh..and the Mosquitos had my room number last night as well. Big Time! I woke up totally disoriented as to the day and the time. It was 1:30pm on Sunday in the tropics, which meant it was 2:30pm on Sunday on the East Coast, which meant the Colts and Jets were kicking off the AFC Championship game in 30 minutes. I knew just the place the only place to watch it on HD tambien. I put down some black beans out of the can, drank some water, and jumped a Collectivo(more on them later) to Dan’s Deluxe Café, that sits just above the Zicatela Beach break. I watched with much less enthusiasm than I normally do. Probably because there was no money on the game. Since it wasn’t the Cannucks, I couldn’t tell who the predominantly Canadian audience was rooting for. I finally concluded that they were just happy to see good plays being made by either team. At halftime I ran barefoot down to the beach. Very few humans on the beach. Nobody in the ocean. I walked back to Dan’s for the start of the second half. Garcon sure did put on a show for his native Haiti. I was tempted to watch the second game between the Saints and the Vikings, but thought better of, and for myself. It was 5pm. I walked home along the beach. It was about that time when the human and canine population on the beach is at its peak. Got back to my tree and took a 10 second shower. Took some corn out of the can & some jalapenos out of the can, and added them to the black beans that were still in their own larger can, and polished that combo down. PC was fast asleep. I stretched for five seconds, and read about ten words before falling asleep. I slept with the light on as my way of tricking the mosquitos. It didn’t work.